Kim recently returned from a photographer’s paradise, the area surrounding Moab, Utah where millions of images are captured by hiking visitors each year. The opportunities are everywhere and therein lies the challenge: capturing something unique and truly outstanding. Kim has here answered the challenge. This scene was photographed in Bootlegger Canyon en route to Corona Arch. She says, “The entire trip I was fascinated by the designs in the sandstone, particularly the striations of lines and swirls. 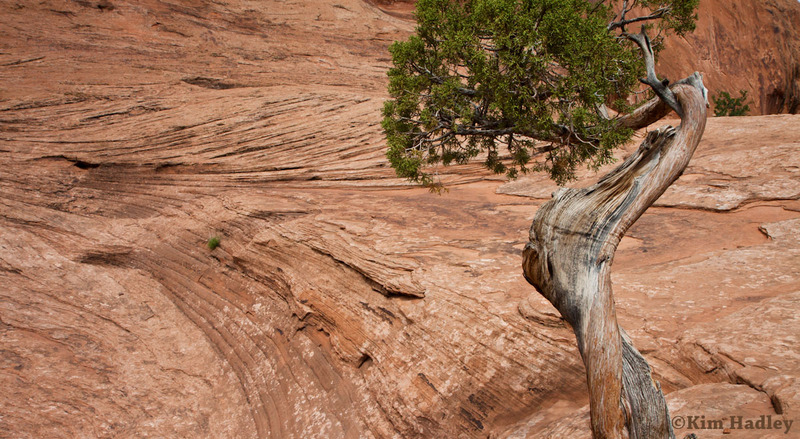 In this shot the twisted trunk in the juniper seemed to mimic and almost merge with those in the slickrock.” One could write extensively on why this image is so powerful but an alternative is to let each viewer study the image and come to their own mental conclusions. Or better yet, post his/her thoughts as a comment to share with others. You’re encouraged to do this as an exercise to help understand what constitutes good photography and then apply the same principles to your own work. This entry was posted in Landscape, National Park, Nature and tagged Canon, Kim Hadley on May 24, 2013 by GAR. You caught nature making a statement…a strong one. Thank you. Sometimes I can view a photo and the depth of whats in it doesn’t become immediately apparent. For me, it took reading some comments of what other photogs saw, for me to see what I had missed in my “too brief” perusal the 1st time around. This is “fer real” the photo that keeps on giving. Great eye, Ms. Hadley, and all the other photo skills that go without saying. Much 2-D artwork reads from left to right, but this photo reads, no, ZOOMS, from right to left. And the little bit of green bush on the left keeps the tree from being totally different from everything else, as well as setting up a vertical thirds structure for the composition! Nice work, Kim! This is beautiful, Kim. It’s so fluid and full of motion. It almost makes me dizzy to keep looking at it. I really like it! Just beautiful!!! Motion, depth, articulation – wonderful and delightful!